GLENWOOD SPRINGS — Colorado Mountain College’s board of trustees approved a 2018-19 operating budget of $64 million Wednesday, June 27, an increase of 1 percent from the previous year’s budget. The board of trustees also approved an extension of President Carrie Besnette Hauser’s contract, meaning she’ll remain in her role for four more years. According to a news release released by the school, projected revenues are up about 3 percent, reflecting increases in state revenues, motor vehicle ownership taxes and a slight decline in oil and gas revenue. The new budget takes into account 3 percent cost-of-living salary increases for all employees and an additional pool of funds for potential merit increases. The budget reflects significant cost savings due to different retirement plan options for new employees, as well as salary savings when longtime employees take advantage of the college’s voluntary early retirement plan. The school’s budget is based on an expectation of slightly lower enrollment for the 2018-19 year, and the college says enrollments are strong. But trustees heard, at the meeting, the college’s leadership assumes the state’s strong economy will continue to affect enrollments in the next term. The budget reflects no new impact in 2018-19 from the Gallagher Amendment, a state constitutional amendment that regulates property tax assessment rates, the news brief says. The budget also takes into account the appropriation of $15.5 million in capital funding from reserve accounts, $15.3 million of major capital spending from bonds, and $900,000 in current year spending. The funds will support construction projects at CMC’s Spring Valley campus, the purchase of 30 Breckenridge housing units, and programmatic and design work at the Aspen campus. The school said in a press release that the decision to keep Hauser came after a months-long process. “At the conclusion of a months-long process, and citing great confidence in the college’s direction and recent accomplishments, as well as a sincere desire to ensure long-term stability, the CMC Board of Trustees approved a new four-year contract for Dr. Hauser to begin July 1 and run through June 30, 2022,” the school’s news brief said. 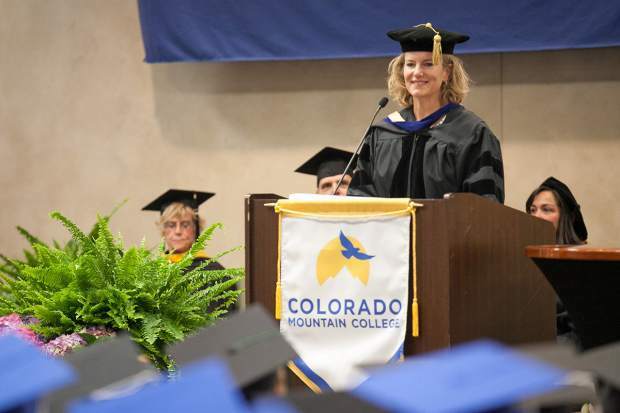 Board President Patty Theobald said retention and graduation rates at CMC exceed national benchmarks and that under Hauser’s leadership, the facility has become a “higher-performing” institution. School officials also say Theobald commended several other trustees for their efforts to update Hauser’s contract, which included Trustee Peg Portscheller, of Parachute. At the meeting trustees also approved a general policy for institutional debt, to provide a structure the college can use to manage and monitor its institutional debt, including bonds and certificates of participation. Trustee Doris Dewton of Eagle County verbally resigned from the board of trustees, effective in August after the school’s board retreat. The board of trustees has 60 days to appoint a replacement for the remainder of Dewton’s term, according to the school’s public information officer.